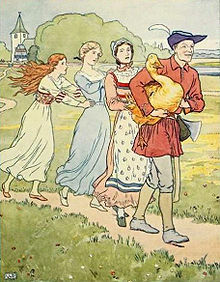 During this transfer season, I am constantly reminded of a story by the Brothers Grimm: The Golden Goose. This is a funny story about a simple man who was generous to an old man & was given a golden goose. When people saw the goose, they wanted to take a piece of it but was stuck to the goose instead. They wouldn't let go even though others laughed at how funny they looked. Once in a while, a school will receive golden geese in the form of teachers who are head & shoulders above the others. Every school administrator loves to welcome such teachers & they naturally want more of them. On the other hand, they should also be prepared for that one day when goose will want to go. How many principals would refuse to let go of the golden goose? I have heard of too many & sometimes it's the District Education Officers who get stuck to the golden goose. They held onto the goose because it was golden but little did they know that greed & selfishness reaps what it sows. How many times have I seen a golden goose turn into a molten goose burning everything in it's path to get that coveted transfer? They cause enough nuisance so that the administrator will be relieved to see them go. In the process, they lose themselves & our country loses a great asset because they will probably repeat from step 1 when they face difficulties at their new school. What about the other geese in the pen? When they see how the golden goose is treated, will those who want that elusive transfer want to be golden geese themselves? I believe this sets a horrible precedent for the profession: If you don't want to be in that school, cause trouble until you get to the school you want. Someone once told me "if you are too good, they won't let you go so don't be". It is a very practical advice but it is very bad for our profession & esp for the students. To administrators, I say let them go. A teacher whose heart is not at your school would NOT make a good teacher anyway. They'll distract themselves with other stuff (tuition, Avon, etc) to fill that hole in their heart. Even when they fail to get the transfer, they will know that you are on their side & will be better able to continue working with you. Dear principals, remember where golden geese come from. Great teachers are MADE not BORN. YOU are the leader of the school. YOU are responsible for making golden geese. I'm sorry to be so critically honest with you but that is what I would expect from you too. You should take proactive steps to turn every one of your teachers into golden geese or you have failed as a leader. You should not be dependent on handouts or luck. Leadership is a conscious choice to do things a certain way to inspire loyalty & excellence. You have been empowered by the ministry. Now, lead the way. If you are not willing to lead, please step down. Dear teachers, remember why you became a teacher. If you are looking for money, sorry, wrong profession. Please RESIGN. Go into business. I think the local curry puff seller is making even more than I am. You wouldn't want to be one of those corrupt officials siphoning money off the school now, would you? Or do you? If you are looking for an easy job with half-day work & lots of holidays, sorry, wrong profession. Please RESIGN. Good luck finding a job like that. Even get rich quick schemes make you work & beggars have to beg too. If you only want to teach in rosy grass is greener schools, sorry, I apologise to the world for conditional teachers like you. You bring shame to our name. Every student given to you is an honour. From the dumbest to the smartest. Poorest to the richest. From deep in the jungle to up in Gangnam street. You should treat them with the same love & work for them the way you'd work for your most favourite students/school. Anything less makes you unworthy of your name, Cikgu. Dear teachers, where you are shouldn't be a hindrance to you being the BEST teacher that you can be. Whether you get the transfer or not, you will still have students looking to you to lead them. Are you willing to sacrifice them on your vendetta against a Napoleon administration? Is it ethical? They deserve nothing but your best. You are paid to give them a good education. Just like your own children, they should be in the centre of every decision you make as a teacher. If you are not willing to bite the bullet & be a teacher at the school you are placed in, please RESIGN. Anyway, all the best! May you get your transfer & still be better nonetheless!